Studied piano at the National School of Music of the UNAM and received her Bachelor of Arts from the University of the Cloister of Sor Juana. She has worked in professional audio since 1993 and specializes in editing systems and digital recording since its appearance. She was chief engineer in the control room of Nezahualcoyotl Concert Hall, the most important in Latin America. She worked there from 1995 to 2005, and during that time she conducted the recording and transmission of radio and television for more than 800 live concerts. She has collaborated either as recording engineer, or record producer and editor on more than 80 albums with major orchestras and ensembles of Mexico. Valeria has participated in several debates about microphones and their specific application within the orchestra and solo instruments in different locations, both studies as concert halls. 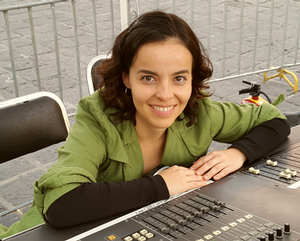 She has worked in different seasons as audio engineer at the Instituto Mexicano de la Radio, Estudio 19, International Festival of New Music, and Music and Performance International Festival, among others. Some career highlights include recording music for movies: "Frida" (Julie Taymor, 2002 Oscar winner for Best Music), "Zurdo" (Carlos Salces, 2003, Ariel winner for Best Music) "The Crime of Father Amaro" (Carlos Carrera, 2002, nominated for an Oscar for Best Foreign Film), and "Walkout" (Edward James Olmos, 2006), among others. She is currently Vice President AES Latin American Region, and has given several specialized lectures about music production and recording of symphony orchestras.